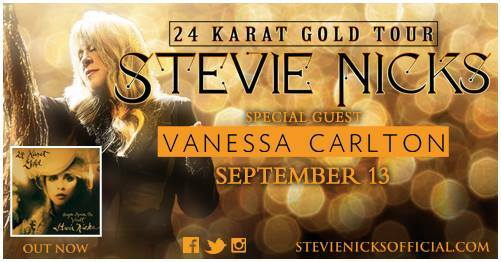 Stevie Nicks is bringing her 24 Karat Gold Tour to The Family Arena on Wednesday, September 13, 7:30 p.m. The legendary Nicks, a Rock & Roll Hall of Famer and multi-platinum Grammy Award-winning solo artist, will perform her classic hits along with longtime fan favorites from throughout her entire career as a solo artist and member of Fleetwood Mac. Nicks has collectively sold over 140 million albums. Nicks will sing some of her gems from early in her career along with material from her last two albums, In Your Dreams and 24 Karat Gold – Songs From The Vault. With special guest Vanessa Carlton.